Hey guys. I want to switch from my panasonic to my samsung smart tv which I thought would be a much better TV but it looks like crap compared to the panasonic. There is a ton of settings on the smart tv which I tried to adjust but Im not having much luck. Here you can see the panasonic on left and samsung on right. How can I make the samsung look like the panasonic? Some TV's have default settings for movies, games etc. You may havee to find this setting in the menu/remote. If not it looks like you will have to manually adjust contrast, colour. I have a Samsung Smart TV i myself use for playing both PS4 and PC games on and never had any issues with the screen being darker than it should be. Try this though change picture type to Dynamtic and then scroll down to Picture options and see if LED Clear Motion is turned On if it is Turn it off that makes your screen dark. Thanks guys i will try those settings. I did try game mode and the pic looks worse than it actually is. The details are clear but the colors dont seem to pop like the old tv and overall you can see the picture looks kind of dull. I can get it close as far as the colors but i cant get rid of the dull picture. Its not really blurry or fuzzy just dull like everything is on the same plane. Nothing pops. Other than dynamic those appear to be the default settings. I do have film mode but its set to off and greyed out for some reason. A colour tone other than "cool" will usually result in less blue hues. Which Panasonic is that? It looks nice. Its a Viera LCD. Its like 15 years old, I cant believe it still works and looks better than my damn smart TV. Ive been able to get the picture close but Its just not the same, even the sounds are different. 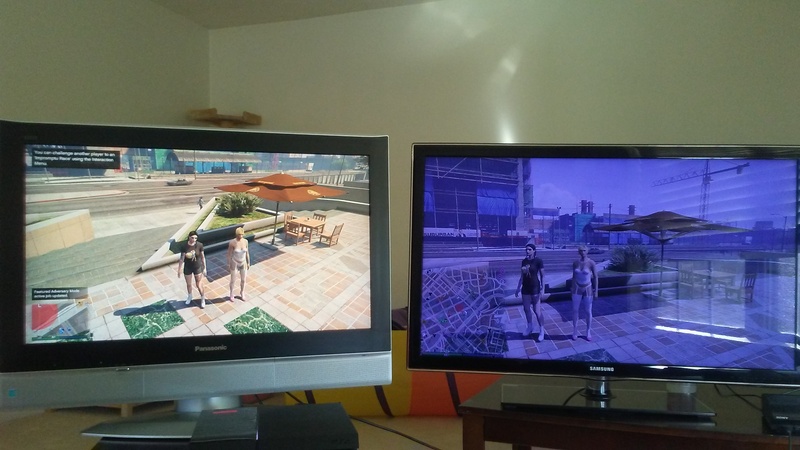 Idk if I just got so used to the old TV playing gta on it for almost 6 years now. Pretty nice tv. Panasonic seem to be known to have one of the best picture quality. The sounds can't be changed due to sounds technology, all our devices sounds different. If you can't stand the sounds of the smart tv, you can connect a speaker to it? And I can share the same thing. Been playing GTA SA on laptop screen and then one day I had to move over to desktop and monitor and bam, everything looks so different lol. It's just us being stubborn and don't wanna change haha. You'll get used eventually (or not lol) but if I were you, I would keep using the Panasonic TV instead of the sh*tty led smart tv. If you would have an OLED tv, you'll get superb colors, perfect blacks and everything. Your Panasonic tv is a plasma which has better blacks than led tv's.